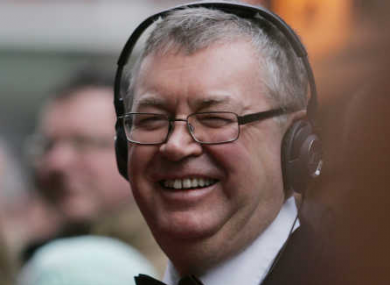 JOE DUFFY’S PHONELINES went down during Liveline today, so he did what any self-respecting broadcaster would do. He played The Corrs. Anyone in such peril could surely do nothing but look to Andrea, Sharon, Caroline and Jim for help. And he did, in the form of ‘Runaway’. Which is probably exactly what Joe wanted to to when someone in Montrose cut the line between him and his women in Clontarf. Joe said that there were “50 people” trying to fix the phonelines, but to no avail. We didn’t really get an explanation as to what exactly happened but Joe had his suspicions. The Russborough Jinx. Yes, the supernatural problem that causes the famous Wicklow house to be repeatedly burgled over the years. Well, the jinx must have now moved to south Dublin. Liveline was talking about plans to move the famous paintings when the tech gremlins/ jinx struck. People were having a field day on Twitter though. At first, Joe didn’t seem quite sure what to do. But it turns out he’s just as good at talking to himself as he is with his loyal fanbase. After a while though, he ran out of his own thoughts. Enter Philip Boucher-Hayes and later Fergal Keane to the rescue. There was only really one hero of the show though. Email “Joe Duffy's phonelines went down today, so he just played The Corrs instead”. Feedback on “Joe Duffy's phonelines went down today, so he just played The Corrs instead”.